You know that something is up when a politician starts mouthing off about a particular issue. Chances are that he or she has had a deep and meaningful with a spouse, a colleague or . . . more likely these days the back-room researchers that have alerted them to a blip on the radar. It’s when the blip starts to look like an angle, a foothold or some kind of leverage to prise open the soft heads and hard hearts (or is it the other way round?) of the voting public then heaven help that blip, because it is about to be pounced on by a pollie. 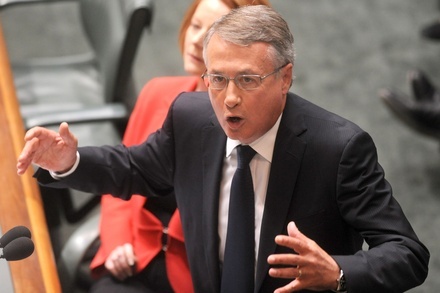 Australia’s economic success is at risk from a tiny minority of wealthy business people who are using their money and influence to ”poison” the political and economic debate with arguments that benefit their self-interest but hurt the community, the Treasurer, Wayne Swan, has said. Quite right too Mr Swan, apparently you have read the mood corectly. People are getting sick of Mega-Wealthy bullies. Dr Q is not against wealth, excellence or free enterprise but here’s the thing. In a world where a good number of hundreds of millions of people can’t get the basics like fresh water, food, shelter etc. Where large numbers of our own indigenous peoples don’t get even a basic level of education and mostly lack opportunities to progress into the professions . . .in this kind of world it shouldn’t take a great deal of imagination to find something creative and productive to do in terms of positive outcomes. But paying for the atrocious Lord Monckton to come out here to spread his misinformation and climate change denial lies really isn’t one of those things. Nor is attempting to control the media and public opinion by buying up a slice of a large daily metropolitan newspaper. Remember Superman? You may have awakened a giant Gina . . .a superhero and protector of the people. In any case you have been pounced on by a pollie. Meanwhile Mr Swan seems to have been watching the THRIVE Movie and listening to the message from the Occupy movement. It’s in the language – the talk of Wealthy Elites and the 0.1% Once it gets to this stage you know something’s bubbling up to the surface. It might be time for you Mega Wealthy elites to start making large donations to Greenpeace. It could help your case in the not too distant future. But don’t take my word for it just keep reading the Sydney Morning Herald and watch this space. You have been pounced on by a pollie. God Bless Foster Gamble. What a beautiful human being!! !